Do you ever get writer's block? I'm pretty sure everyone above the age of 12 has experienced writer's block at some point. (Because by that time you've had to write a school paper or two.) Recently, I was facing a very similar dilemma in the world of baking: I wanted to bake. But I had no clue what to bake. My whole kitchen stretched out before me, my pantry bursting with ingredients, but my mind was racing to come up with a recipe but couldn't think of anything out of the ordinary. Peanut butter? Delicious. But done before. Caramel? Used a lot. And stressful. Pumpkin? Too early. I was given the artistic freedom to do whatever I wanted with these ingredients. And I did. It took a lot of brainstorming. And a whole lot of FoodGawking. But I finally came up with an idea. And because my mind never strays too far from peanut butter, yes, it involves peanut butter. And Nutella. Because come on, it's Nutella. When you were a kid, did you ever have peanut butter and Nutella sandwiches? Peanut butter and marshmallow fluff? Peanut butter, marshmallow fluff, AND Nutella? I normally had peanut butter and Nutella- it was always me go-to sandwich. Even if my mom didn't always let me eat it. I always wanted it. Everyday for lunch beween the ages of 3 and 7 I'm pretty sure I had PB&J, and there were a few lucky times in there where I got peanut butter and Nutella. They are a classic combination. And they always remind me of when I was younger, and of sitting at the lunch table in first grade comparing sandwiches and boasting that I had one with Nutella on it. Recently, I've had a lot of firsts and lasts- my last day of middle school, my first day of high school. My last day of summer. Molly's last day of summer of her last summer ever. All these firsts and lasts wear a person down. They make me want to remember the good old days of peanut butter and Nutella sandwiches, you feel me? So I made these cupcakes. BUT, I was never one for having marshmallow fluff and peanut butter. We just never kept marshmallow fluff around the house, and frankly as a kid that combination would have sounded very weird. So I decided that in order to properly compare these cupcakes with the sandwich they are based off of, I should make one. The verdict? With the sandwich, the flavors of the spread were more flavorful (very articulate, but I hope you know what I mean) but the marshmallow fluff was over powered. In the cupcakes all the flavors blend together better, and create a more sophisticated cupcake. Do you see that chocoalte milk there? Best. Chocolate. Milk. Ever. EVER. It's Trader's Point Creamery Chocolate Milk. Google it and see if you can buy it where you live. I promise I'm not being paid to advertise it- it is just that good. The Cake Doctor recipe turned out as I hoped it would. The hazelnut extract made it taste stronger than Nutella, but it ends up working with the frosting. And I definitely recommend swirling Nutella into the cupcakes, because why not? So the one problem with these, I think, is that I didn't really use the sprinkles very adventurously. I had come up with plans to melt them down, use them as dye, or as funfetti. But alas, I just put them in the frosting. Although it did have a very pretty effect, didn't it? One thing you can do, if you want (and you definitely want) is to use the cupcake you scoop out to replace with filling and any leftover frosting you have and make cake balls! The recipe is simple. Combine all the leftover parts of the recipe: cake, filling, frosting in a bowl (mixing with your hands is encouraged) until it is well mixed (and looks lovely, just like in the picture) and then form it into balls and freeze them. And trust me, if you are worried you have grown out of the tastes buds required to enjoy a good fluffer-nutter Nutella sandwich (because that would be a cause for extreme worry), plenty of adults tried these and enjoyed them. One of my teachers at school described it as, "Definitely one of the best cupcakes I've ever had! (it didn't last long)." 1. Preheat oven to 350 degrees. Line a cupcake tin with cupcake liners. Set aside pan. 2. Place the cake mix, milk, melted butter, eggs, and vanilla in a large mixing bowl. Blend with an electric mixe on low speed for 1 minute. Stop the machine and scrape down the sides of the bowl with a rubber spatula. Increase the mixer speed to medium and beat 2 minutes more, scarping the sides down again if needed. The batter should look well blended. Pour batter into pans, and place a teaspoon of Nutella in each cupcakes and swirl it. 3. Bake the cupcakes until they spring back when lightly pressed with your finger, 27 to 29 minutes. Remove the pan and let it cool before removing the cupcakes. 1. Mix marshmallow fluff with your desired amount of peanut butter (it’s up to you, depending on the flavor you want. I used 1/2 cup or so). 2. Add milk a little at a time, until the texture is thick, but a little less sticky and more easily piped. You don’t want it to seem watery or slack, though. If it gets too thin, add some confectioners sugar to thicken it back up. 1. Beat butter for 2 minutes, until pale in color. Beat in the marshmallow, sugar and milk for an additional 3-4 minutes, until fluffy. 2. Stir in however many sprinkles you want. Once cupcakes are completely cool, scoop out a little from the top and pipe in filling. Pipe frosting on top. 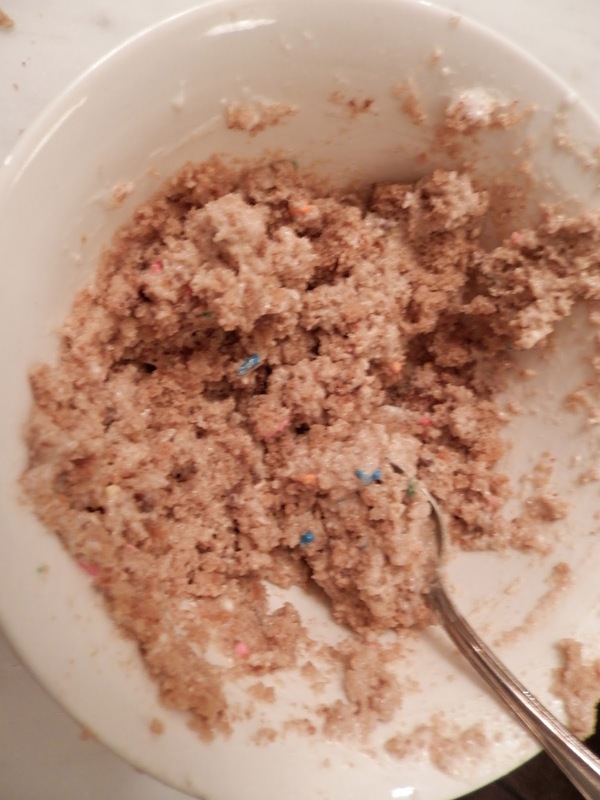 Put extra cake pieces in a bowl and mix with the elft over frosting and filling. Form into balls and freeze. No, that's great! We love that you liked the recipe enough to feature it :) Do you have a link? We'd love to check out your post.